The first time I personally met Tita Melon was during the OLAS seminarians’ carolling at the parish, around Christmas time of 2006. 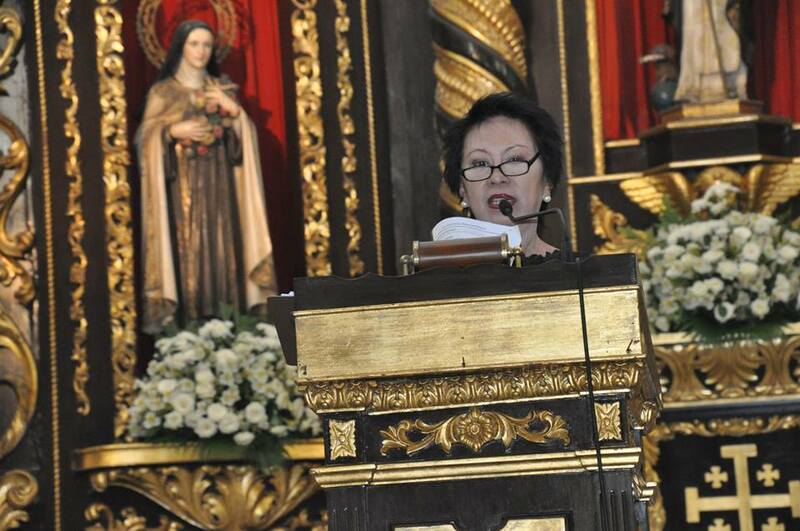 The event was organized by the Order of Franciscan Seculars (OFS) of SSAP of which Tita Melon was then OFS Minister. We became very good friends since then until her untimely demise last year. I have heard about Tita Melon even when I was still a temporary professed friar but it was only this time that we became close. As a Secular Franciscan and a former Minister of the OFS community of SSAP, Tita Melon followed the Lord all her life through the examples of St. Francis of Assisi especially in simplicity and poverty. Tita Melon was very simple in her ways and looks. As a Secular Franciscan, her life of poverty is seen very glaringly in her overwhelming generosity. I got to know her up close in her very act of giving during the Christmas carolling of the OLAS seminarians. It was her idea that instead of them going around the houses, it will be the seminarians who will be the ones invited to come to the parish for a buffet dinner and to perform Christmas carols, not only to the OFS but also to the invited members of the SSAP community. While OLAS was important to her, I also remember her working for CRIBS Foundation, Inc. CRIBS takes care of abandoned children, providing them with shelter, food and Christian education. She organized fund raising projects for CRIBS, as well as for OLAS. One of which is a play, “The Fiddler on the Roof”. The proceeds was given to OLAS. I also heard from her that she has been to our rural parishes in Cagayan Valley doing relief mission. She also went to Franciscan communities as far as Mindanao attending the IRD program during its beginnings. I am also aware that she gave away countless donations to friars’ projects and even for their personal needs. She joined many relief missions in her life especially when she was the Minister of OFS. The spirit of poverty means to claim nothing as one’s own. Tita Melon generously shares her time, energy and resources for others especially for the seminarians. She believed that they are the future evangelizers. Before she died, she was busy soliciting to build a school in the OLAS campus. Unfortunately, she will not be able to witness its completion but the beautiful OLAS Porziuncola Chapel which she helped build will be an edifice to mark her life of poverty expressed in her overwhelming generosity. As published in the January 15 issue of the Parish Bulletin.